PT Eurokars Motor Indonesia (EMI) hosted the annual Mazda Dealer Excellence Award Ceremony on 27 March 2019 at the Intercontinental Hotel in South Jakarta. At this prestigious award ceremony, the highest achieving Mazda dealers received recognition for their outstanding efforts in attaining exceptional customer satisfaction levels in their efforts to promote the Mazda brand. In addition, five top sales persons were accorded the Best Mazda Salesperson Award, and another five individuals were conferred the Best Customer Relationship Coordinator Award. The PT EMI Mazda Dealer Excellence Award aims to ensure that Mazda customers are continually treated to the most satisfactory and highest level of customer service at every touchpoint of their journey and interaction with the Mazda brand, from sales to after sales. It celebrates the achievements of Mazda dealers in Indonesia whose sales and after sales operations exemplify excellence, propel business performance and attain high levels of customer satisfaction. All the winners have demonstrated business success and commitment to enhancing customer satisfaction amid a challenging and competitive market. “In line with the premium branding and positioning of Mazda in the automotive market in Indonesia, it is vital for us to provide both our existing and prospective customers with a consistently high level of service excellence and satisfaction, and also strong engagement in order to build enduring customer loyalty and support for the Mazda brand. Our network of Mazda dealers are the ones who embody and convey the essence of the Mazda brand to our customers at every single touchpoint. Delivering exemplary customer service while maintaining profitability across all facets of the business is no mean feat, and this makes their achievements worthy of recognition.” said Mr Roy Arman Arfandy, President Director of PT EMI. The Mazda Dealer Excellence Award 2019 is awarded to five of the finest dealers in Indonesia based upon a survey which was conducted from January to December 2018 using a stringent set of evaluation criteria. The dealers were ranked according to several key criteria, namely: achieving sales and spare parts targets; high customer satisfaction survey marks; certification of dealers and dealer personnel and scores achieved by individual sales persons at the Indonesian Cup and Customer Relationship Coordinator Contest. 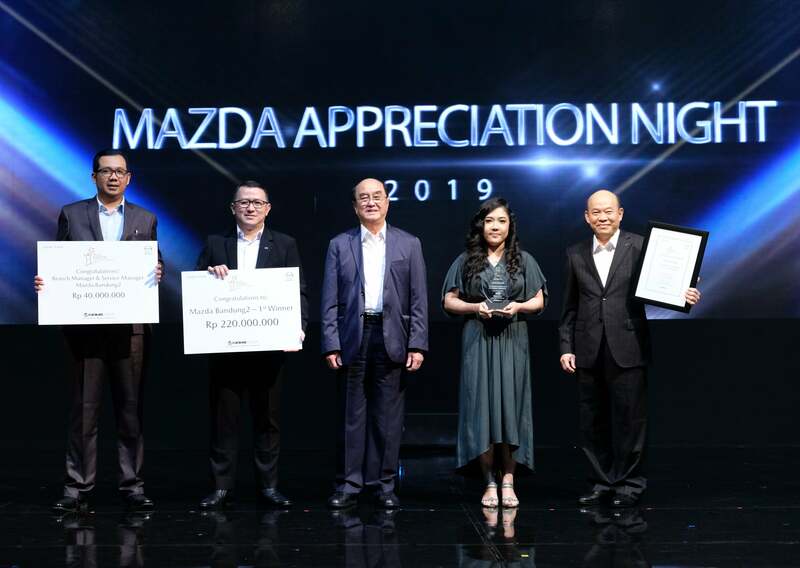 In recognition of the hard work, passion, and dedication of individual Mazda salespersons, both the Indonesian Cup and Best Customer Relationship Coordinator (CRC) awards were also handed out during the Mazda Dealer Excellence Award 2019 Ceremony. Both awards attracted a high number of participants from various Mazda dealers across Indonesia. “PT EMI is committed to continuously raising the professionalism and service quality standards of all sales persons who represent Mazda, and this is evident in the quality and calibre of the participants of the Indonesian Cup 2019. We believe that the winners have set a high benchmark for all Mazda dealers and sales persons in Indonesia to follow,” said Mr Arfandy. In addition to the Indonesian Cup, the Best Customer Relationship Coordinator (CRC) awards were also handed out. The CRC Contest is aimed at promoting the competency of CRCs in maintaining good relations with customers as well as their ability to handle complaints from customers. “The winners of the Mazda Dealer Excellence Award, the Indonesian Cup and the Best Customer Relationship Coordinator (CRC) awards are all iconic role models of the best-in-class Mazda customer service, and strong advocates and ambassadors of the Mazda brand. The PT EMI Mazda Dealer Excellence Award strives to commend and thank them for their significant contribution and unwavering efforts to go the extra mile to meet the ever-changing needs of today’s consumers, and surpass their expectations. We remain dedicated to empowering Mazda dealers to continue to provide superior customer service and reinforce the standing of the Mazda brand in the Indonesian automotive industry,” said Mr Arfandy.